PCI compliance has become a business requirement for any company involved in the processing of credit card information. It requires strong security controls over all systems and applications that process or store cardholder information. 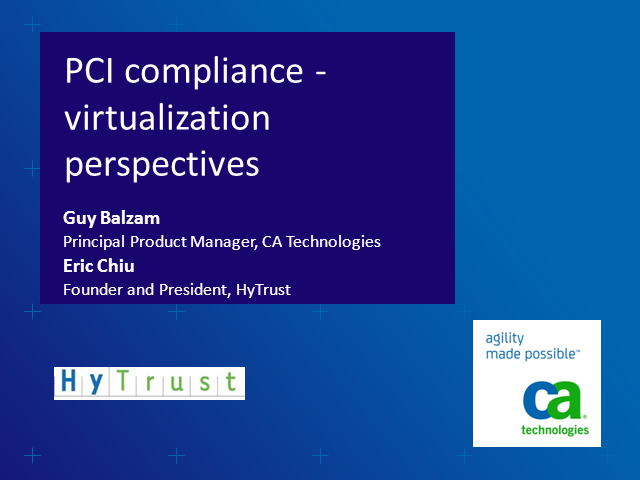 The PCI Council released new Guidelines for Virtual Environments on June 2011 that include new requirements for PCI compliance. These new requirements require security capabilities not mandated by the original PCI Guidelines. In this session we will review the new requirements and see how CA Security solutions may help customer complying those new challenges. Guy Balzam has over 12 years of experience in IT and Information Security both as a developper and consumer of IS products. In his past roles Guy specialized in enterprise security, managed the ELAL airlines IT security unit and led their PCI certification process. With his vast knowledge of identity and access management Guy is now a Principal Product Manager of leading security products for CA Technologies. Eric Chiu is CEO and co-founder of HyTrust, Inc. (http://www.hytrust.com/), a virtualization security company based in Mountain View, CA. He brings significant executive experience in high tech management and finance to this role. Previously serving as Vice President of Sales and Business Development at Cemaphore Systems, a leader in disaster recovery for Microsoft Exchange, Chiu built these departments from the ground up, consistently delivering significant quarter-over-quarter revenue growth and putting in place key OEM partnerships. Before that, he led Business Development at MailFrontier until its successful acquisition by SonicWALL. Formerly a Venture Capitalist for Brentwood (now Redpoint) and Pinnacle, he also served in the M&A Group for Robertson, Stephens and Company. Chiu holds a BS in Materials Science and Engineering from UC Berkeley.